UPDATE: A NOBBY farmer is in an induced coma awaiting surgery after his legs were seriously injured in a farming accident. Edwin Metzroth sustained a cracked pelvis and tissue damage to both his legs when he became trapped by a cattle feeding machine. His family said it was "miraculous" that his injuries were not more severe. 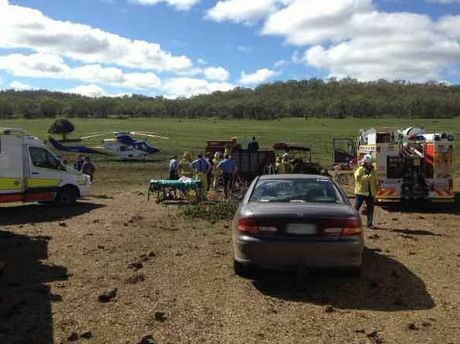 EARLIER: An elderly man has been airlifted by RACQ CareFlight Rescue to Toowoomba Hospital in a critical condition after his legs were caught in a cattle feeding machine. The man had been feeding stock on the Nobby property, south of Toowoomba, when his legs became snared in the rake like device. Five Fire Service crews, two Queensland Ambulance Service teams, police and the CareFlight specialist doctor and intensive care flight paramedic worked for two hours to free him. He has extensive lower limb injuries and blood loss. 11AM: Emergency services are working to free a man seriously injured after he became trapped in a feed bin on a property south of Toowoomba. The incident occurred about 10.45am. It has understood the man has suffered lacerations to his legs. He is trapped upside down in the bin. Emergency services at a Nobby property where a man has been seriously injured after he was trapped in a feed bin. Emergency services say it could take up to an hour to free the man. A medical team is being transported from the Toowoomba Hospital to the accident scene. 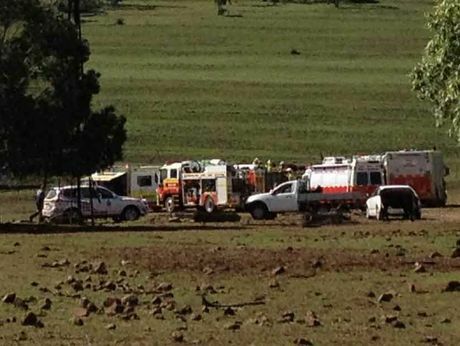 The accident has occurred on a property on the Mount Kent Boundary Rd at Nobby, south of Toowoomba. Several emergency services crews from Toowoomba have been deployed.